As a parent, you want your kids to eat what you cook for dinner and these Kid Friendly Foods are sure to be a fit for your menu plan. Not only are there fun meals in here that appeal to kids, there are great healthy choices that will appeal to the whole family . From fun cookies and drinks to twists on classic meals like Sloppy Joe’s and soups! Crockpot Sloppy Joes – Every kid loves eating this messy and yummy sandwich. This recipe is easy to throw together in a Crockpot and have dinner ready in a few hours without a lot of fuss! No Bake Coconut Cranberry Energy Bites – These are perfect for getting your kids to choose a healthy snack! Creamy Tomato Basil Soup – This is so easy to assemble, and tomato soup is a perfect kid friendly lunch! Serve with Grilled Cheese on the side for a hearty and yummy meal you are happy to serve them! Fruit Caterpillar Kid Friendly Snack – Sometimes it just takes taking ordinary foods and making them look fun to get kids interested in eating them! Coconut Chicken Tenders – These are delicious and of course classic for all kids to enjoy! Easy Chicken Noodle Bowl – Not only is this a quick and easy meal, it has everything kids love about chicken noodle soup! Peanut Butter Coconut Bites – Another yummy appealing snack that is healthier than the candy bars and chips your kids might grab for! Easy Vegetable Noodle Beef Soup – This is a great last minute menu item that will be a hit with kids and adults alike. Grab alphabet noodles and toss in for even more fun! Easy Breakfast Roll Ups – These are a super easy meal to make for your family for breakfast. Plus I bet they would be great made ahead and frozen for quick reheating! Mac N Cheese Pizza – Um – what more could you want? This is of course the epitome of kid friendly! Rainbow Cookies – Delicious – Fun – Easy – This is a keeper for sure! Roasted Chicken Sausage & Potato Hash – This is a super simple meal that appeals to kids. Kids love sausage and potatoes, so combining them is easy. Potato Chip Chicken Strip – Another great spin on a classic chicken nugget or chicken strip that kids will love. Kool Aid Pops – Everyone loves this cool snack! Vegetarian Taco Soup – It doesn’t get much simpler than this meal you throw together and serve with chips, cheese and sour cream! Pancake Muffins Recipe – These are a super easy and fun way to customize breakfasts for your family. Let kids help pick what you put in each “muffin” and make them unique for everyone! Rainbow Fruit Pizza – This is a favorite dessert treat to make with kids! Crockpot Pinto Beans – Yes, we find that Pinto Beans are actually really kid friendly. Add in some taco seasoning and mash to make refried and tuck into a burrito with cheese! Easy Homemade Candy Bars – Um – HELLO! Candy Bars!!! Pizza Kabobs – These are fun to make, easy to customize and a huge hit with kids and adults alike! 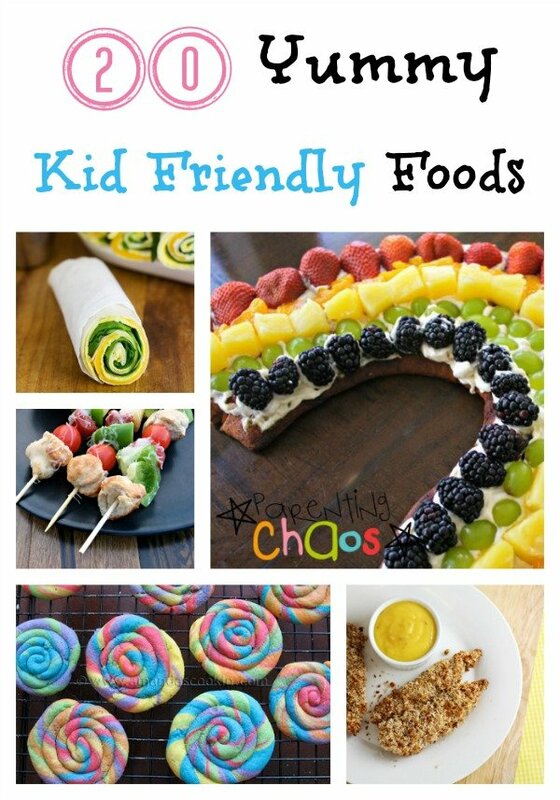 When you are looking for fun and delicious foods to make for or with your kids, this list of kid friendly foods is sure to be a hit. Not only are there great health choices, there are classic flavors your kids will love. Mac & Cheese, Pizza and Chicken are always a hit with kids!